I am afraid of mice….are you? I don’t mind them if I am looking at them in a pet store or in a contained space, but if they are running around in the wild, I am afraid of them. One time I was staying in a lake house and I heard a mouse trap snap. I could hear other mouse friends running around in the closet….EEK! My husband tells me it is illogical to be afraid because they are afraid of me too….BUT, I don’t care….I don’t want a mouse to be near me! Anyway, Today I have some Cute Mouse Crafts for Kids and Adults. 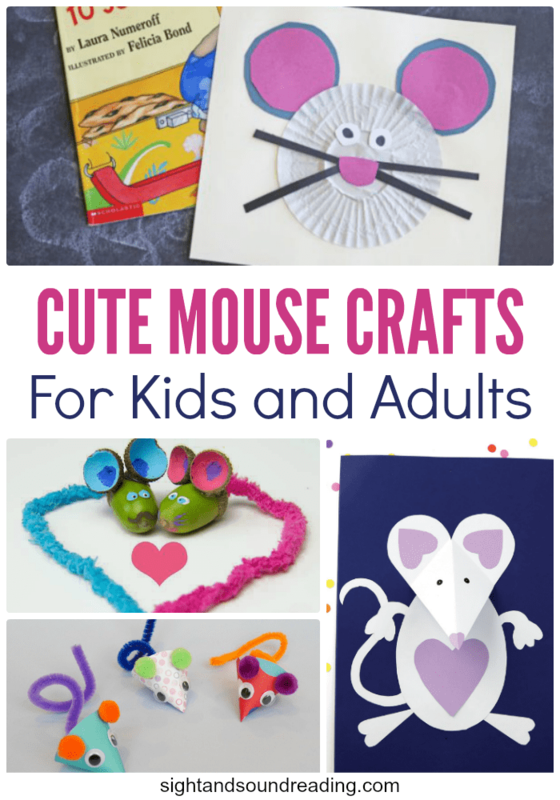 These are easy mouse crafts that will be fun to create! In addition, here are a few books that are great for teaching the letter M. Click here if you want more book ideas/book list for the letter M! This 3D Paper Mouse from The Craft Train will look cute to put on the wall. I found this Weekly Letter Craft! M is For Mouse from Must Have Mom is quite simple and will look good to display. Kids just start reading? Do you need them to follow the words and letters? DIY Plastic Spoon Mouse Reading Pointer from Artsy Momma will be a great craft to make. There isn’t only Christmas wreath. Quick and Easy Mickey Mouse Wreath from Mad in Crafts will look fabulous to hung on the front door of kids bedroom. Love fingerprint arts? Then, this Night Before Christmas Mouse Footprint Craft from Learning and Exploring Through Play is great for you. Minnie and Mickey are popular with their ears. There are many ear bands sold in merchant, but you can make a DIY Minnie Mouse Ears from Crafts Unleashed in simple steps. Easy Painted Mouse Rocks from I Heart Crafty Things look sturdy, but they are so cute. Everyone should see how cute Mouse Finger Puppets from Craftulate are. Do you want to give a birthday gift to children? Duct Tape Mickey & Minnie Gift Card Holders from Crafts By Amanda will be cute to accompany.